Home > Arts and Crafts Projects for Kids > Mother's Day Crafts for Kids to Make Handmade Mother's Day Presents, Cards, and Gifts for their Moms. Below you will find Mother's Day crafts projects for kids to create Mother's Day handmade presents, cards, and gifts for their Moms. This is my favorite Mother's Day Gift of all time. My son made one of these for me about 6 years ago and I loved it. He got a great big applesauce jar and cleaned it out and decorated the outside of the container. And then he cut up little pieces of paper. On each of them were loving notes for me. Every time I had a bad day or that I got sad, I was allowed to grab one of those loving notes to help cheer me up. It was so loving and thoughtful that I still cheerish that gift. Some ideas for loving notes ... You are the best cook ... I love your hugs ... your smile makes me smile ... You make me happy when you play catch with me...You are the prettiest lady in the world to me....and I'm sure that you can think of your own special notes too. Your Mom will love this gift as much as I did. Start off with a styrofoam tray as the base....if you don't have this, I'm sure that you could cut out a piece of cardboard instead. Find a photo of yourself for the frame. On the back of the tray or cardboard, trace around the photograph carefully. Now you will cut about a quarter inch inside the line that you traced...you want it a bit smaller than your photograph. Now dot glue all around the edge of the front of your photo. Now position the back of the styrofoam tray or cardboard on top of the picture...making sure to take the time to center it properly. Now you can make it pretty by decorating the front of the frame with lace, scaps of fabric, buttons, ribbons, beads, decorative paper, felt, or any other itemst hat you might have around the house. You can also write a message of love somewhere on the frame...such as 'I Love You Mom' or 'Best Mom' '#1 Mom' or you can just write 'Love YOUR NAME, 2011'. Take a piece of ribbon, yarn, string, or cord and tape it to the back of the frame so that your Mom can hang up your beautiful picture. I hope that your Mom loves her new picture frame. 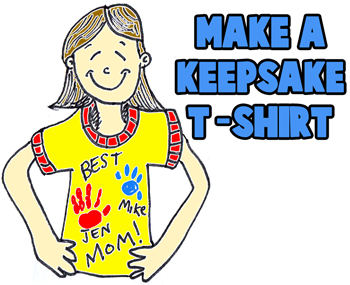 Buy your Mom a T-Shirt from the dollar store or another inexpensive store. Place cardboard or wax paper inside the shirt so that when you paint on the shirt it doesn't try closed. Get out some fabric paint. Then place a bit on a paper plate and every child in the family should stick their hand in the paint, one by one. Make sure the hand is completely covered, but not dripping wet, and then put the hand on the t-shirt. Everybody can paint their name or draw it with a Sharpie permanent marker. Also write 'Best Mom' or '#1 Mommy' or something sweet for your Mom. Let the paint completely dry. Follow the directions on the fabric paint...you might have to wash the shirt before she can wear it. If that is the case, let her know this. Your Mom will always cherish this beautiful t-shirt. (CLICK ON IMAGES ABOVE TO SEE THEM LARGER) Find a large piece of decorative paper (any size will work but the bigger the better). Now you will want to find the center of it and cut it so there are 2 long rectangular pieces that are the same size (picture #1) Now you will want to bend this piece of paper in half (picture #2)...and then do this yet again (picture #3). Now unfold it and turn it to the other side. (picture #4) Then Recrease the folds in the opposite direction. (picture #5) Then Overlap the pages so that the pleats all look like there is no break in the patter, as seen in (picture #6). Now that all of the pleats are in place, you can find the pictures that you want to put in your picture book. Glue one on every page...and if you want to make it look nicer, glue a colorful piece of paper behind the picture so that the paper peaks out from behind the picture (as seen above). Glue everything together. Now find a colorful piece of paper to wrap around your accordion book. Glue the first and last page of the accordion fold to one side of the colorful paper (as seen in picture #7). Cut 2 slits on the back of the book (on the colorful paper) and thread ribbon through the 2 slits (as seen in picture #7). Tie the ribbon in the front of the book as seen in (picture #8). Decorate the front cover in honor of your Mom for Mother's Day. This is a handy mini-broom that your Mom can hide in her purse for times when she might need it. She can bring it to work with her for when she has little episodes where she needs to clean something up. Find a lipstick that your Mom doesn't want anymore or pick a large lipstick at the dollar store. Carefully remove all the lipstick from a large empty lipstick tube. From an old broom cut a clump of straw about 1 1/2 inches long. Fill the lipstick holder with strong glue or ask dad to help you with the hot glue gun and insert the clump of bristles. Hold them in place until the glue sets. Then wrap it and give it to your Mom for Mother's Day as a special present. 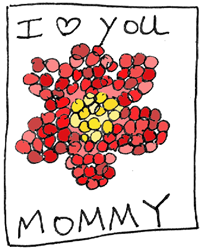 This is a great way to make a beautiful picture for your Mom. Mosaics is the art of making a picture from small pieces of paper, glass, tile, etc. In this case we will be using ripped or cut paper pieces.In the above picture, I show a mosaic flower, but you can make anything that you want. You can rip little pieces of colored paper from magazines, decorative paper, or anything else that you want. Then form the object that you want...it always turns out awesome! Your Mom will love this gift. My kids made this one year when they were toddlers and I still have it years later. I still love them because I can look at their little handprints. This is self explanatory...just go out and find a great stone that is big enough to either make a handprint on it or to put a design on it. First paint the rocks a base color...for example, the stone on the top left has a base color of yellow and the stone on the right has a base color of blue. Let it dry for an hour or so. Then you can dip your hand in the paint and make your handprint. On the right, it is a fingerprint that is then used as the center of a flower. Then you can choose what writing you want to put on the stone...such as maybe your name and year so your Mom can always know how old you were when you made the rock. 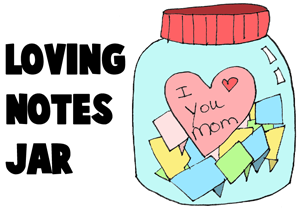 You can also put things on there such as 'Best Mommy' ... 'Best Mom' '#1 Mom' ... 'I Love You Mom' or whatever else you want to write to your mom. This makes a great keepsake gift. Get out 2 paper plates, the 8 inch size kind. Cut one plate in half. Face the hollow parts of the plates toward each other. Mark places to punch holes for paper fasteners. Punch 2 small holes for a cord by which to hang this handy pocket on the wall. You may lace the plates together with bright colored yarn, string, or cord, as seen in figure 1 . Also you may decorate the plates of the wall pocket by covering them with crepe paper, shellac, cloth, pictures from magazines, envelope linings, or household wax. Putting a coat of wax over all the decorated surfaces makes it easy to clean the wall pocket with a moistened cloth. Whenever possible shellac the wall pocket. Use 2 coats of transparent shellac. Be sure the first coat is dry before the second one is applied. This keepsake craft will make your Mom smile from ear to ear...there is no doubt about that. Get some clay (not play dough) out and a rolling pin. Then roll the clay flat so that it is about 1 inch thick. 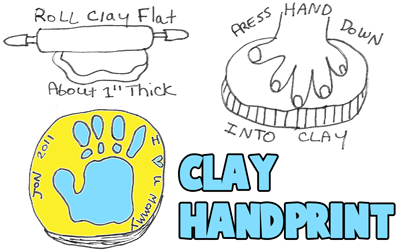 Now press your hand down into the clay firmly. Now let the clay dry....this is different for every clay...it depends on the type and how much moisture is inside of it. When it is completely dry, paint it in beautiful colors. You can even add a message and your name and age (so years from no your Mom will know how old you were when you made it). You might have already learned how to do this in school...as I know that my kids did. However, just in case you didn't learn, I will show you. Get some self-drying clay (not play dough) and roll the clay in your palms to form a ball. Now poke your thumb into the center of the clay ball as pictured above. 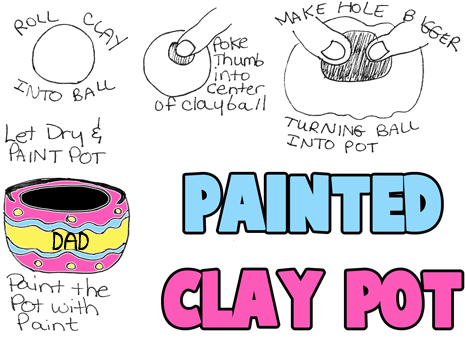 Now use both of your thumbs to make the hole larger and larger while you slowly rotate the clay, slowly turning it into a pot. Let the pot completely dry...this might take days, depending on the clay that you use. Once your clay pot is dried, now it is time to get creative. Paint your Mom's pot in beautiful colors. Make sure that your Mom knows that THIS ISN'T FOR FOOD OR COOKING USE, this is a pot to put her keys in or other knick knacks. Get out some decorative paper or construction paper and cut out 2 1/2" from construction paper for the handle...check out the pictures above. Now you have a square and a handle. If your paper was bigger than a normal piece of construction paper, then cut down your paper until you have a square piece of paper. Now fold the square into a cone, overlap the paper and staple together. Now use the handle piece and staple that on the top of the cone. 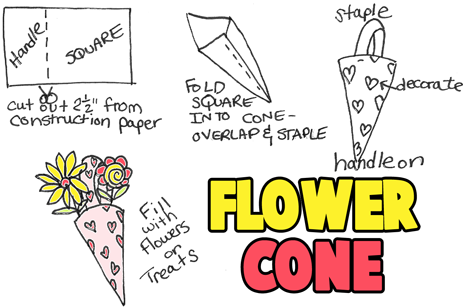 Now fill with wild flowers or make flowers with the following flower crafts. This is easy to make but will be treasured by your Mom when you give it to her for Mother's Day. All you need to do is to get 2 cups ....preferably with one being a bit bigger than the other one. Paint the cups gold or yellow. You could also cover them with yellow paper. Let the cups completely dry. To make the handles use yellow paper or color some paper yellow. Follow the instructions above...draw 2 circles. 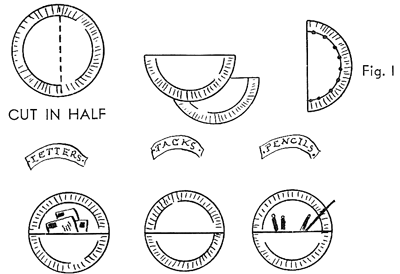 On each one, draw a half circle and then cut it out. Then fold the side that is solid in half...as seen in picture #4 above. Then Glue these handles to the trophy. 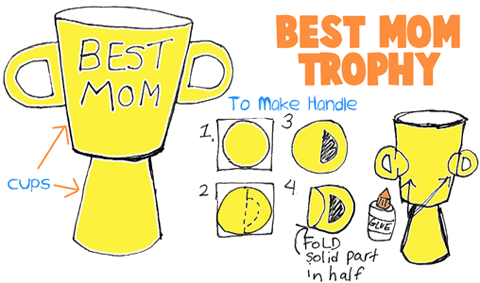 Paint or Draw 'Best Mom' on the Trophy. Optionally, you can fill the trophy with treats or candy...or folowers...or whatever you think your Mom would like. If your Mom is a knitter or a crocheter, then how about making a knitting box yarn dispensing unit for her. These 3 compartments each will hold a ball of wool yarn. This way the yarn won't get tangled together. Find a big rectangular box....one with a lid. To create these sections, measure and then cut out, 2 pieces of cardboard so that they will fit tightly inside the box. These section will make the compartments in the box. Place the partitions in the box, so that they divide it into 3 equal sections. Find the instructions for this craft here. Decide on what design your are going to draw out...thinking about what sort of things your Mom likes. Map out color areas on it. Trace the design on cloth, using a sharp pencil to do this. Fill in this design with well-sharpened crayons, using vertical and horizontal strokes until the desired color tones have been acquired. After the coloring is done, place material between layers of damp cloth and press with a warm iron (with help from your Dad or other adult other than your Mom). Optionally, finish the tapestry with any needlework that will give a finished appearance to your design. Give this as a special present for your Mom on Mother's day and she can then mount it on on a rod for hanging. If you want it to look like it is hanging on a rod already, you can attach it to a wrapping paper cardboard tube. This would be an ideal Mother's Day or birthday gift for mom. She will be delighted with your thoughtfulness, especially if you use the same colors for your canister set, as mom has in her kitchen. Remove the covers from 4 quart-size ice cream containers. You may use 2 quart-size and 2 pint-size, if you prefer. Paint the covers and the bottoms of the containers separately. Use a solid color paint and allow them to dry thoroughly. Paint 4 spools of the same size, in a contrasting color paint. Allow them to dry. Glue a spool to the center of each container cover. Label the front of the canisters, coffee, tea, sugar and flour, in contrasting color paint. Allow them to dry, then paint a similar decorative design on each canister. If you like you may glue on appropriate magazine or Internet printouts / cut-out designs, instead. Make a special pouch that your Mom can take with her wherever she goes. Fill it with something special like notes with loving messages on them, or a picture of kissing lips so she can have a kiss from you when you aren't with her. Your Mom will love her love pouch. Make it by following the instructions above. This craft is quite simple in idea and is really inexpensive to make. Your Mom will love this present on Mother's Day. Juat trace the photograph of yourself or of your Mom and Kids with the jar lid or cap that you are using. Then glue it into the cap and then glue a folded triangle onto the back of the cap. It now will stand up like a real-picture frame. This makes a beautiful gift for Mom. You will need Two 4" squares of small mesh netting, 1 yard colored yarn or ribbon, and potpourri filling. Cut netting any shape desired. Lace netting together along 3 sides with yarn or ribbon. 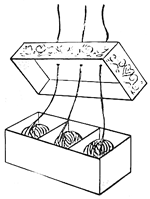 Place potpourri between netting and complete lacing. Tie lacing in bow and loop over hanger. Before making this craft from a matches folders, remove the staples of the folder and the matches, AND ask an adult if it is okay for you to do this craft. Cover the folders inside and out with wallpaper, wrapping paper, ribbon, cloth, or some bright-colored paint. Fasten to the striking surface of the folder a 2-inch strip taken from the cutting edge of a wax paper, tin foil, or saran wrap box, and bend the excess firmly around the back to make the thread cutter (see first picture above this paragraph). Cut a piece of felt or flannel, 1 1/2" x 1 3/4" and put a needle and three straight pins through it. Notch the sides of a piece of cardboard of the same size with three pairs of notches. Wind short pieces of different colored threads around the notches. Staple the felt and cardboard inserts inside the folder. Now you have an adorable miniature sewing kit as a gift for your mom. Make a Playing Cards Love Book for Mom - This is a book that you make from a deck of playing cards. Tell your Mom 52 reasons why you love her. Awesome. Make a Potholder or Memo Holder for Mom - If you have 2 paper plates and either ribbon or needle and thread then you can make this pot holder or memo holder for Mom. Make Flower Holders Gift for Mom on Mothers Day - Flowers make a great gift for Moms on Mother’s Day…they are beautiful, just like she is, inside and out. How about making a pretty flower holder vase for the flowers that you pick for her (or buy for her). This beautiful flower holder in which you can place real flowers would make an especially nice Easter gift for someone you love. Painted String Covered Pencil Holder - This is a very creative way to show mom that you love her. This would look great on her desk. Envelopes Coupon Case - This craft is made from envelopes that are looped together. This makes a perfect Mother's Day present for Moms who like to clip coupons. How to Make Jewelry Storage Box Craft for Mom on Mother’s Day - Does your mom love jewelry? Well, Mother’s Day is coming up and today we will teach you to how to make a very special jewelry box for your Mom. Make this nice keepsake box for her to store her favorite jewelry. It will be a great gift for mother’s day. So find an old box and follow the instructions to make this gift. Make Pot Holders Gift for Mom on Mother’s Day - This is a great craft for older children, girls, and teens. This is a more complicated arts and crafts project than many of our other crafts ideas, so read over the following craft before deciding to do it. This pot holder craft would make a great gift for Mom or Grandma on Mother’s Day. Make a Helping Hands Gift for Mom's Pins and Needles - Help your Mom find her pins and needles with this handprint craft. Make an Oven Mitt for Mom - If you have an old towel sitting around that your Mom doesn't want any more...make a beautiful oven mitt for her out of the towel. Make Sewing Box or Organizational Box with Step by Step Instructions - Sewing boxes make great Mother’s Day gifts as well as presents for birthdays and other special occasions. Below you will find easy step by step instructions for putting together a great sewing box. Make Picture Frames Holder Gift for Mom on Mothers Day - Here is another gift idea to give to your Grandmother or Mom on Mother’s Day. This would also be great for Dads and Grandfathers for Father’s Day. 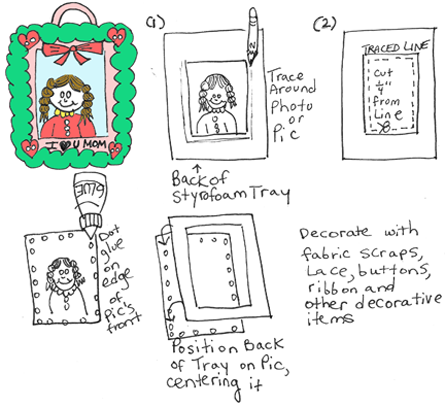 Make a picture frame from cardboard and the instructions below. If you are looking for something to give Mother for her desk, a picture holder like the one shown here is certain to please. Handprints That Help with Chores - Not only does every Mom love handprint crafts from their children, but they also love a promise of help with chores. This is both tied in one, literally. Make Letter Holders Box as Gift for Mom on Mother’s Day - Make this cool letter holder as a gift for Mom on Mother’s Day or Dad on Father’s Day or for someone else you love. You can make this attractive and useful letter holder box gift in which to hold correspondence letters. Make a Family Newspaper for Mother's Day - This is a great crafts idea that will produce a keepsake to cherish in years to come. Make Mommy a Bandana Apron - A great first sewing project for kids to make as a gift or for themselves. Make a Mothers Day Foam Chef Doll Gift for Moms Who Like to Cook - Does your Mom cook the best food? Does she love hanging out in the kitchen to cook you the best food? Don’t you think that your Mom is the world’s greatest chef? Show her what you think of her by making this chef doll out of foam for a Mother’s Day present. The simple step by step instructions are given below. Mini Address or Phone Book - This is a perfect gift for Mom because she can stick her little phone book into her purse. 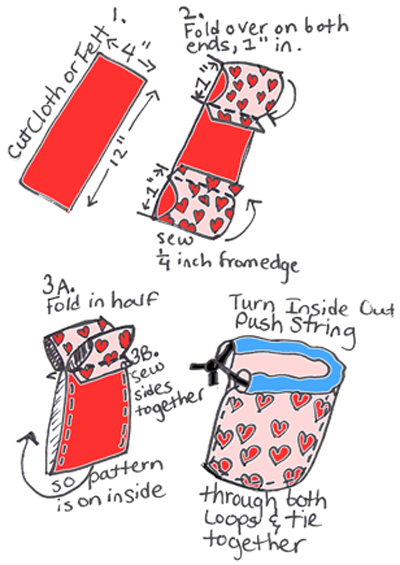 Make Cosmetics Case for Girls or as a Gift for Mom on Mother’s Day - This is an easy sewing project with easy illustrated instructions to make a make-up / cosmetics case. Girls and Teens will love making this cosmetics bag / case / wallet – whatever you want to call it. It is also a great project to make for Mom or Grandma on Mother’s Day…and it would also be a great group project for Summer Camp or Girl Scouts. Altoids Tin Sewing or Emergency Kits - Make a pocket kit for your dad on Father's Day. It can be an emergency kit, a a camping kit, a fishing kit, a sewing kit, or whatever type of kit you want. How to Make a Bunch of Flowers as a Gift for Mom on Mother’s Day - Make this beautiful branch full of flowers picture for your Mom, Aunt, or Grandma this Mother’s Day. This picture of a bunch of flowers looks much harder to make than it actually is. All you will need to make this beautiful piece of art is some colored paper, scissors and glue….oh, and lots of Love. House Napkin Holder Gift - Make this napkin holder, shaped like your home to give to your Mom as a present this year. Popsicle Stick Trinket Box - You can make this popsicle stick trinket box for holding little things - called trinkets This trinket box makes for a great gift for someone special or keep it for yourself. Photo Paperweights - Your mom would love this photograph paper weight on her desk. Make Stationery Holder Crafts Gift for Mom on Mother’s Day - Need ideas for gifts to make for your Moms for Mother’s Day? Every Mom I know has a box full of stationery for times when they need to write correspondence and other type of letters. This attractive and useful gift is made from a pressed paper package tray and cover from a super market. Make Book Holder for Mom's Desk- This is a great craft to make for a gift book holder for Mom on Mother's Day. Make Jewelry Box for Mom with Egg Carton - Make a jewelry box with an egg carton and foil pan. Make Mommy a Miniature Notebook - This is a great mini notebook for Mom to put in her purse for quickie notes. Make this as a Mother's Day gift for her. Easy Origami Heart Paper Folding Origami - This is an easy paperfolding craft to make with your kids before visiting a grandparent or loved-one who would surely love this *heartfelt* keepsake. It’s also easy to include in a card or letter, since it’s flat. Pen Holder for Mom's desk- If you want to make a pen holder for your Mom's desk than this is a great craft...it is quite elegant. Bobby Pin Holders for Mom - If your Mom uses bobby pins a lot, then this is a great gift to make her so she doesn't lose them any more.